Midtown() After several years experimenting with the formula in trials, Atlanta Incorporated has inked an agreement with Birmingham leaders that will convert our city into the first full service Atlanta franchise. 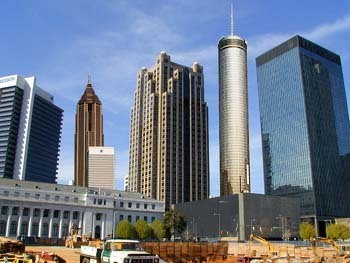 To pay for the franchise license, the Birmingham City Council has agreed to give one percent of all sales tax revenue to Atlanta Inc. located in Alpharetta, Georgia. In order to comply with franchise rules, Birmingham must make several cosmetic changes. First and foremost, Richard Arrington Jr. Blvd. will be renamed Peachtree Street and Messer-Airport Highway will be renamed Peachtree Industrial Blvd. The BJCC will now be called Georgia World Congress Center, while the coliseum will be known as the Omni. Rickwood Field will become Turner Field, and Legion Field will use the old Atlanta Fulton County Stadium name. In addition, if a domed stadium is ever constructed, it must be called the Georgia Dome. Atlanta Inc. will do everything possible to transform the Birmingham area into a true Atlanta location, but company officials acknowledge that some aspects of Atlanta will be difficult to duplicate. "Stone Mountain is a pretty big undertaking," said Atlanta Inc. CEO Jane Redmond. "But Birmingham has agreed to allow us to carve a likeness of The Bear on their Half Dome." Birmingham will not be required to build a rail transit system, but will use DART buses to connect critical Atlanta neighborhoods. Five Points South will now be called Little Five Points and will be connected to Virginia Highland (Lakeview) by the DART line. Other areas on the DART line include Downtown (former BJCC area), Midtown (former UAB area), and Buckhead (Forest Park). As part of the deal, UAB will be renamed Georgia Tech and must give up football, or at least promise to never beat Florida State. Redmond believes that after working on the project for the last ten years, Birmingham is ready to be awarded a full franchise. "We have this thing nailed down pretty good already," said Redmond. "Gorin's did not work out, but that was our very first implementation. Well...technically I guess Wuxtry was our first try, but that didn't even work out in the real Atlanta. But everything we have tried lately has been going like gangbusters." Redmond cites Surin West, Bell Bottoms, The Atlanta Bread Company, Target, and the newly opened Mellow Mushroom as prime examples of the Atlanta formula in action. "We even expect Visionland will change its name to Six Flags Over Alabama," said Redmond. "But we can't force them since Visionland is not within the city of Birmingham." Other local businesses seem to be getting into the Atlanta spirit as well. Club South has decided to start showing soccer on Saturday mornings and may even change its name to the Rose and Crown. But not everyone is pleased at the further Atlantization of Birmingham. Local Christian groups are upset over the prospect of soccer being shown, and Alabama fans blasted the decision to officially name the Civil Rights District the Sweet Auburn Cultural District. "I believe most people will realize that nothing has really changed," said Birmingham Mayor Bernard Kincaid at a Clermont Lounge (Ona's Music Room) luncheon. "It's just that now we can keep our dollars here instead of going to Atlanta all of the time. Just look at it as Atlanta without all the people." Downtown() The CBS Network, the Southern Baptist Convention, and the Catholic Diocese of Birmingham in Alabama are teaming up to produce "Christian Survivor," a spin-off of the popular television program Survivor. Already, thousands of area Christians have sent in their applications to local CBS affiliate WIAT Channel 42 (formerly WBMG). After screening the applications, a final twelve contestants will be chosen through a rigorous inquisition to be held at Shades Mountain Baptist Church in Vestavia. The twelve will be split into two separate tribes called the Catholics and the Protestants. Although religious background will not necessarily determine a contestant's tribe, all those believing in predestination will be placed on the Protestant team to avoid conflict. For the same reason, Orthodox Catholics and Episcopalians will be required members of the Catholic tribe. Once the tribes are finalized, the contestants will be locked in at Briarwood Presbyterian Church (PCA). Each week the tribes will face an immunity challenge inside the JudaSphere. The first challenge will be the Deuteronomy cook-off, where each team must properly prepare live animals for consumption. The team that loses must cast out one member during supper. When only six players remain, contestants will forsake their previous tribes and form a new congregation. From that point on, the least pious member will be exposed every three days through the drawing of lots. That contestant will then be shamed and spit upon during their ingnominious walk into exile. Members of the new congregation will play for "eternal life" before every drawing, with the winner being temporarily immune to both expulsion and Satan. Challenges for "eternal life" will include: Church Hymnal Trivia, Alter Construction, tracking Jesus' Family Tree, Bible Verse Scattergories, Secular Temptations, and the Worldly Possessions Game. 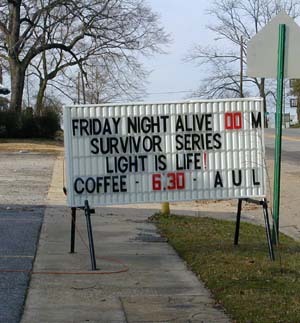 There is still some debate as to whether homosexuals will be allowed to participate in Christian Survivor. However, there is no such debate about cultish Mormons and Jehovah's Witnesses, who are specifically excluded in the official rules. Downtown() Seventeen misspellings on the front page was too many even for Birmingham's most cavalier newspaper. In order to save money and improve editing, the paper has laid off four full time copy editors, and issued Texas Instruments Speak & Spells to the remaining two. The Speak & Spells were recently purchased by the paper through the online auction site Ebay. Careful attention was paid to the sellers' profiles before any bids were placed by postheraldude, the newspaper's online id. Some concern was raised about one modified Speak & Spell, but the seller had a turquoise shooting star rating with zero negative feedback. There was one neutral comment, but it was from an Ebay user no longer registered. Copy editors at the paper seem pleased with their new Speak & Spells. "I am always misspelling 'formerly,' but I have not once spelled it 'foremerly' since I got this Speak & Spell," said previous Accent Editor and new Second Editor Wade Kwon. First Editor Dianna Cagle had similar praise for the vintage children's learning toy. "I can't believe this thing is 1978 technology! It is much more user friendly than Microsoft Word, and it talks! Microsoft is just now getting around to adding speech capability to its Office Suite." Post Herald president Jim Willis describes this as a new era of efficiency and accuracy for the niche paper. "We are going to do much more with much less. Instead of relying on several mistake prone human editors, we are going to put our trust in the Speak & Spells and their two trained operators, Wade [Kwon] and Dianna [Cagle]." The Post Herald experienced a huge drop in readership when it switched to an afternoon paper, and sales have continued to decline. The dwindling circulation may not be directly caused by poor editing, but in a competitive Birmingham journalistic market, the Post Herald cannot afford to take chances. "I left the Black & White because I wanted to work at a respectable newspaper," said Kwon. "But these misspellings are worse than I ever experienced doing Wade's 101. 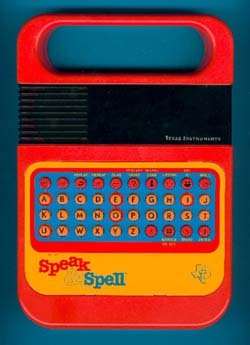 Hopefully this Speak & Spell initiative will reduce the number of spelling errors on the front page from a dozen or so, down to a manageable one or two."